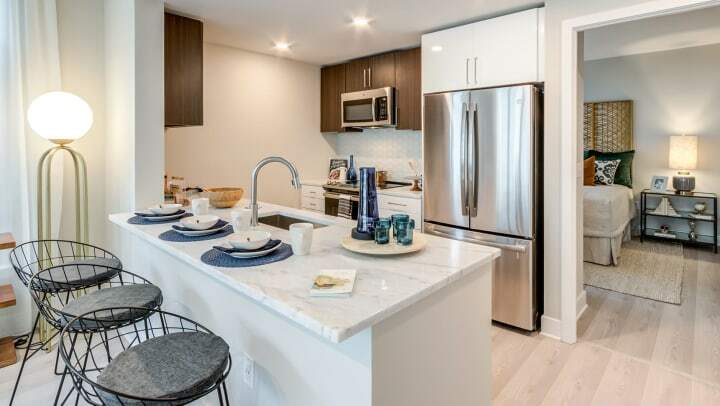 When you live at Gallery Bethesda II, you’re in luck. Our Bethesda apartments give you so many ways to enjoy your life to the fullest. It’s a home like no other. In your Gallery Bethesda II apartment home, a contemporary look combines with a timeless elegance to create a style that’s in tune with your life. You’ll find culinary kitchens perfect for preparing your favorite meals, gorgeous baths designed to help you unwind and handpicked finishes that elevate the everyday, every day. How do you want to spend your day? At Gallery Bethesda II, you’re fortunate enough to have plenty of options, all within our residence. Feel like a swim? Our resort-style jetted pool awaits. Want to dine in the open air? You can do so in our outdoor living and dining area, complete with grilling stations and pizza ovens. Want to be on top of the world? You can head up to the rooftop terrace and let the views entrance you. It’s all here for you. Not everyone is lucky enough to be close to restaurants and stores. At Gallery Bethesda II, you’ll be within steps to dozens of each. Right outside your door, you’ll find everything that makes downtown Bethesda one of the DC area’s most popular destinations, from casual cafés to high-end stores, to cuisine from around the world. At Gallery Bethesda II, luck is all around. But living here doesn’t take a twist of fortune. You can make your own luck by choosing to make this extraordinary Bethesda apartment your home. Take a tour today and see how lucky you can be.